of tubular sewing products in circular sewing processes, thereby contributing to increased productivity and upgraded seam quality. counter stitching of elastic tape. In elastic tape attaching or counter stitching processes for girdles, shorts or swimwear, the machine promises easy handling of the material. The material is placed over the cylinder bed and can be sewn at once without stopping the sewing machine during sewing. 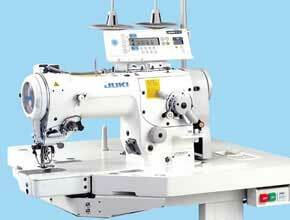 For a flat bed sewing machine, a tubular sewing product is only sewn by rotating it on the bed. However, for this cylinder bed machine, the material is placed over the bed to enable handling to take place under the bed. Sewing troubles such as diagonal creases or uneven material feed that are likely to occur on a flat bed machine due to poor operability can be reduced on this cylinder bed machine. 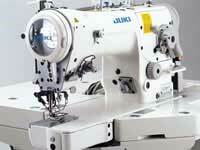 The cylinder bed shape is designed to promise easier sewing of wider tape whose width is up to 50mm. The machine that is equipped with this type of bed can be used for attaching lace to the bottom of a girdle. 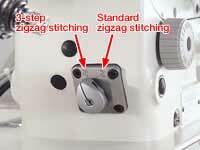 Changeover between the standard and 3-step zigzag stitching patterns can be achieved using the lever located between the machine arm and needle. This means that sewing machine changing, according to the type of zigzag stitches, is no longer required, thereby increasing the facility operation rate. In addition, the machine promises higher cost-effectiveness since use of the machine reduces investment costs. The machine comes with a new feed mechanism that is designed to reduce play and deflection. It helps promise highly consistent sewing performance even at a maximum sewing speed of 5,000rpm (standard zigzag stitch of which the zigzag width is 5mm or less). Thanks to the feed mechanism, the machine demonstrates an increased productivity in processes in which a higher sewing speed is required, such as elastic tape attaching processes. The table stand specifically designed for the cylinder bed has been improved in both strength and rigidity. The pedal location is straight below the center of the needle entry. 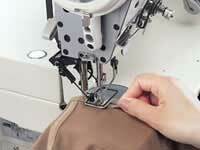 This allows the operator to carry out sewing work in a comfortable posture. Gauges such as a throat plate and presser foot, hooks, bobbins, and bobbin cases, as well as other attachments and devices of the conventional machines can be used with this zigzag stitching machine. The cylinder diameter is 322mm.  Adobe Acrobat Reader is required to view .pdf files.